Pêga-azul / Azure-winged Magpie (Cyanopica cyanus), originally uploaded by Armando Caldas. 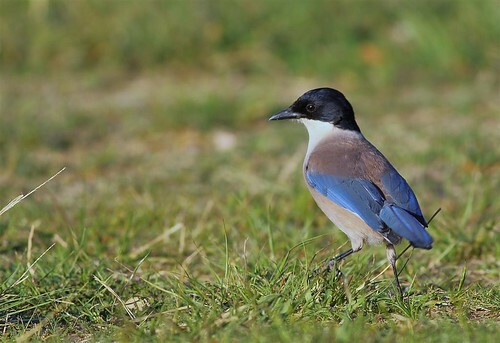 The Azure-winged Magpie (Cyanopica cyana) is a bird in the crow family. It is 31–35 cm long and similar in overall shape to the European Magpie (Pica pica) but is more slender with proportionately smaller legs and bill. It belongs to the monotypical genus Cyanopica. It has a glossy black top to the head and a white throat. The underparts and the back are a light grey-fawn in colour with the wings and the feathers of the long (16–20 cm) tail are an azure blue. It inhabits various types of coniferous (mainly pine) and broadleaf forest, including parks and gardens in the eastern populations. Often Azure-winged Magpies find food as a family group or several groups making flocks of up to 70 birds. The largest groups congregate after the breeding season and throughout the winter months. Their diet consists mainly of acorns (oak seeds) and pine nuts, extensively supplemented by invertebrates and their larvae, soft fruits and berries, and also human-provided scraps in parks and towns. This species usually nests in loose, open colonies with a single nest in each tree. There are usually between 6–8 eggs that are incubated for 15 days. The voice is a quick fired and metallic sounding kwink-kwink-kwink usually preceded by a single krarrah.